As packaging of a product goes a long way towards making an impression as well as providing information to the end users, consumer product manufacturers are not shying away from adopting automation methods that can help them achieve greater product efficiencies. 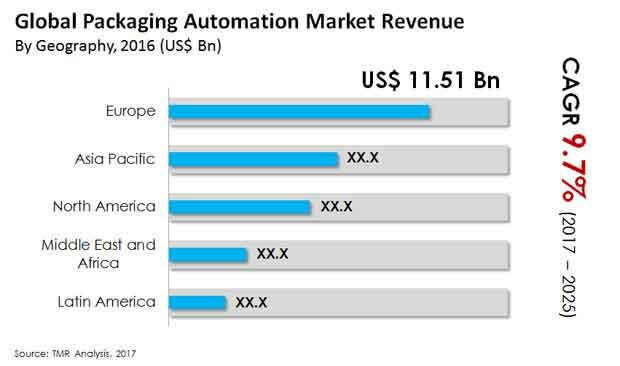 This factor is making a strong thrust on the global packaging automation market, which has been estimated to attain a valuation of US$69.73 billion by the end of 2025, according to a recent business intelligence study by Transparency Market Research (TMR). The report has projected the demand for packaging automation to increment at a potent CAGR of 9.7% during the forecast period of 2016 to 2025. The analyst of the TMR report identifies Siemens AG, Schneider Electric SE, ABB Ltd., Rockwell Automation, Inc., Automated Packaging Systems, Inc., Swisslog Holding AG, Emerson Electric Co., and Kollmorgen as some of the most prominent players who collectively hold major shares in the global packaging automation market. That being said, the competition among these market leaders is stiff too, which in turn is providing considerable bargaining power to the end users. Most of the major players are investing on developing new technologies that adequately meet the diverse demands as a mode of gaining shares over their competitors. For instance, ABB Ltd. is focused on developing packaging robots. As for the new entrants, entry barrier are quite high and therefore, only a few of them are able to make a mark. Application-wise, the TMR report has segmented the packaging automation market into labeling, wrapping, capping, filling, palletizing, and others, whereas product types are conveyors, packagers, and packaging robots. Industry-wise, the market has been bifurcated into automotive, electronics, retail, healthcare, food and beverages, and logistics. Geographically, Europe constituted for the greatest demand for packaging automation. However, Asia Pacific is primed to generate demand at a stronger growth rate than all other regions. The demand for packaging automation is on the rise as they offer striking benefits over traditional methods, including delivery of real-time diagnostics and performance information, ease in integration, and enhanced safety over contemporary technologies. With these automation tools, manufacturers can not only maximize their production capacities and improve packaging flexibilities for different packaging sizes, they can also meet the requirements of consistently evolving workforce. Packaging automation tools are adequate at changing and scaling according to new products and hence are gaining adoption across medium and large industries alike. Constant desire of industry players to reduce labor dependency, growing rate of industrialization and manufacturing functions across emerging economies, and the prosperity of the food and beverages and pharmaceutical industry are some of the other factors that will ensure a healthy growth of the packaging automation market. On the other hand, requirement of substantial initial cost is the primary restraint curtailing the progress of this market.